Made from corrosion-free aluminium with soft plastic recessed grips, our Premium universal hose coupling with Aqua Stop connects hoses with no drip quality to save time, money and hard work. Connecting, disconnecting and repairs are made easy with this high-quality, premium universal hose coupling with Aqua Stop. 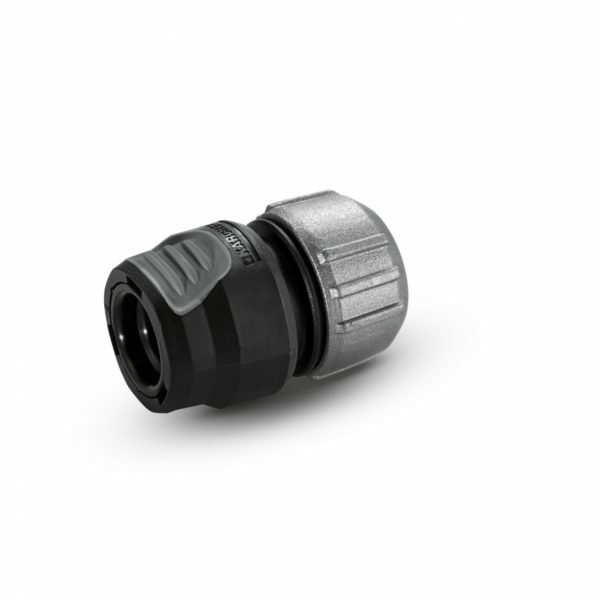 Made using corrosion-free aluminium and soft plastic recessed grips for especially comfortable handling, the flexible connector system of this universal hose coupling with Aqua Stop simplifies the watering of small and large gardens and surfaces. Reliable, high functioning tap connections and hose couplings are essential to any good watering system, and this premium universal hose coupling with Aqua Stop is a vital addition to the Kärcher Rain System; a flexible and integrated system for garden irrigation. The premium universal hose coupling with Aqua Stop is compatible with the three most common hose diameters and all available click systems, which makes gardening and watering even easier.